The production of planktonic rotifers was studied in eutrophic Lake Ormajärvi. 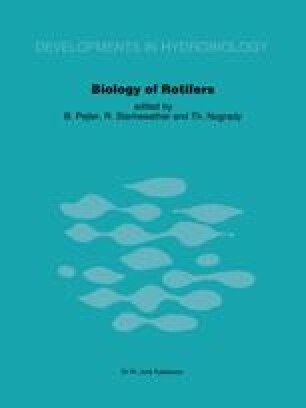 Of the total annual production of rotifers (2.9 g org. C m-2 or 231 mg dry weight m-3) 49% was achieved during one month (July) and 88% during 3 months of summer. The most important producers were Keratella cochlearis (1.2 g C m-2), Asplanchna priodonta (0.8 g C m-2) and Conochilus unicornis (0.6 g C m -2). The P/B ratio for the total rotifer community during the growing season (7 months) was 25.0; monthly P/ B values varied between 0.3 and 5.2. The daily P/B values were highest among species of Collotheca. The relationships of rotifers to some biotic and abiotic factors (invertebrate predators — Mesocyclops, Cladocera, planktonic Protozoa and temperature) are briefly discussed.